The availability of quality, craft burgers options in Greater Houston is growing. Photo by Scott Sandlin. Houston has no shortage of burger joints. Well-established favorites have been around for years, and burger loyalty in the Bayou City is fierce. Houstonians reward quality with dining dollars, and that’s enabled homegrown places like Jerry Built and Bernie’s Burger Bus opportunities to grow. All were once standalone locations; Bernie’s Burger Bus now has two (with a third expected in The Heights) and Jerry Built also has two (in West University and Memorial City Mall). In May 2016, Hopdoddy, which started in Austin, opened its first Houston location, their second on March 6, and a third is on the way. We were invited to visit all of these high quality “mini-chains” that pride themselves on providing humanely raised meat and excellent vegetarian options. It’s important to know these are not “fast food” places as much as they are “fast casual,” nor are they “cheap.” Each promotes their offerings on the basis of quality, not price. These mid-priced options are places to slow down and have a burger experience worth savoring. Burger patty weights range between one-third to half a pound, and the cost varies from $7 to $12, depending on the level of complexity (and additions). Each was prepared to a respectable medium, and the quality of the fresh-ground beef and impeccably fresh toppings were consistent for each visit. Fries are fresh, hand-cut, and available with a broad variety of tasty embellishments. Hand-spun milkshakes complete the experience at all four restaurants, so you’ll be able to complete the burger-fry-shake trifecta no matter your choice. The introductory quote for each of the places featured comes directly from their websites, which provides a sense of the respective missions and core values. Most importantly, all provide quality, handcrafted burger experiences in comfortable environments. Jerry Built Homegrown Burgers, 3501 West Holcombe. Jerry Built opened its flagship store on West Holcombe in early 2012, but the decor and open concept seem as inviting and fresh as ever. Evolution in responding to consumer preferences and suggestions is evident—gone are the original quarter-pound patties that were lost in the scale of the burger platform, replaced by one-third and half-pound options that amply fill the housemade buns. A burger at Jerry Built averages between $8 and $8.50 depending on size and toppings, and can be a combo with regular or sweet potato fries and a fountain drink for $4 more. Sergio’s Corn, roasted sweet corn with housemade lime crema, Jerry Built’s special seasoning blend, and queso fresco, $3. Photo by Scott Sandlin. This is a family-friendly establishment, with options and selections that will even please the little ones. The “Kid Built Baskets” include a kid’s cheeseburger, Angus beef hot dog, or two hand-battered chicken strips, with a choice of fries, mac and cheese, or grilled sweet corn, and a small fountain drink or organic apple juice, and range in price from $6 to $7.50. Unable to settle on a blend or mixture for a vegetarian burger patty, at Jerry Built they provide a grilled portobello mushroom cap for their meatless sandwich alternative. They also have a ground turkey burger in development. The featured seasonal burger from Jerry Built, “The Outlaw” is Angus beef topped with pulled pork, chicken-fried bacon, ghost pepper jack cheese, BBQ sauce, lettuce, pickles, tomato, and onion. $11 for the half-pound version. Shown here with Truffle Parm Fries, $4. Photo by Scott Sandlin. Jerry Built provides fresh, organic ingredients, including sustainably-harvested seasonal produce from local and regional farms. Owner Chad Glauser says that they “can trace the source of the lettuce in the kitchen on any given day to the farm and even the row that it was picked from.” The all-natural philosophy isn’t limited to the produce—Glauser proudly noted that “no multi-animal proteins are served.” Jerry Built only serves pasture-raised beef and poultry that are free of added hormones, antibiotics, and nitrates. Burgers are flame-grilled, and hand-cut fries are cooked in 100-percent non-GMO sunflower oil. Glauser and his team believe this method results in a combination where the customer doesn’t feel as stuffed or “weighed down” by their burger experience. Finish things off with a shake or a made-to-order ice cream sandwich, with your choice of hand-dipped ice cream between two fresh cookies, baked on-premises, for $3.50. Hopdoddy Burger Bar, 5510 Morningside, Suite 100, Rice Village. Now with 17 stores in four states, and more on the way, Hopdoddy’s newest Houston location is in Rice Village (in the space formerly occupied by Baker Street Pub & Grill). There, all beef served is humanely raised as well as hormone and antibiotic free. It’s ground fresh every day in-house. Buns are made from scratch and baked fresh all day, every day. Customers can actually see the back-of-house bakery and food preparation areas as they make their to the counter to place their orders. Special attention is paid to the hand cut fries; Hopdoddy tried multiple potato varieties before ultimately settling on the Kennebec, which they believe delivers the most consistent balance of fluffy interior and crispy exterior. They even go the extra mile in rinsing each batch of cut potatoes twice in a hot water bath before frying to minimize excess starchiness. 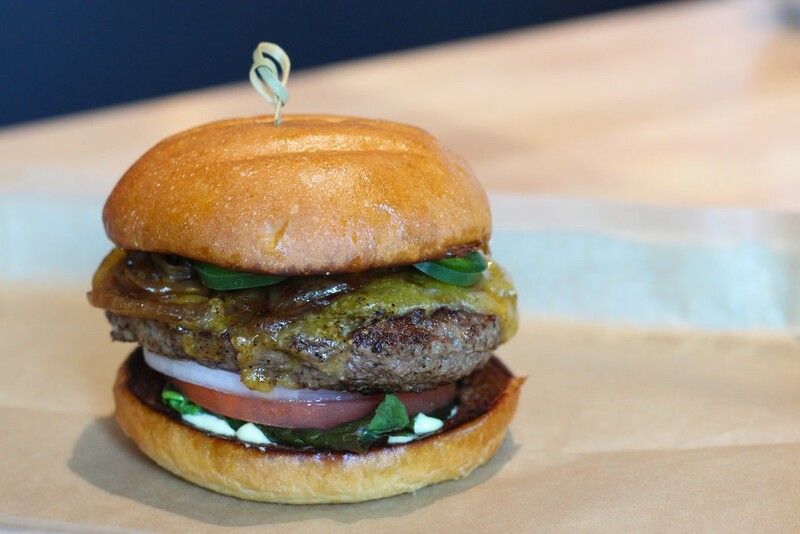 The “Classic Burger” is $7 and it’s a half-pound, 100-percent Angus Beef patty with red leaf lettuce, white onion, ripe Beefsteak tomato, and Hopdoddy’s signature “Sassy Sauce” (a blend of mayonnaise and housemade horseradish honey-mustard). The “Llano Poblano” burger ($8.50), a popular selection, is topped with applewood-smoked bacon, Tillamook pepper jack, seared poblanos, and chipotle mayo. Those looking for an alternative to beef might check out the “Ahi Tuna Burger” ($12.50). It sports a seared, medium-rare, sushi-grade tuna filet with sprouts, teriyaki, honey wasabi, nori chips, pickled ginger, mayo, lettuce, onion, and Beefsteak tomato. Other protein options include bison, lamb, and turkey. Regular hand-cut fries are $2.75 for a small and $5.50 for a very shareable large. 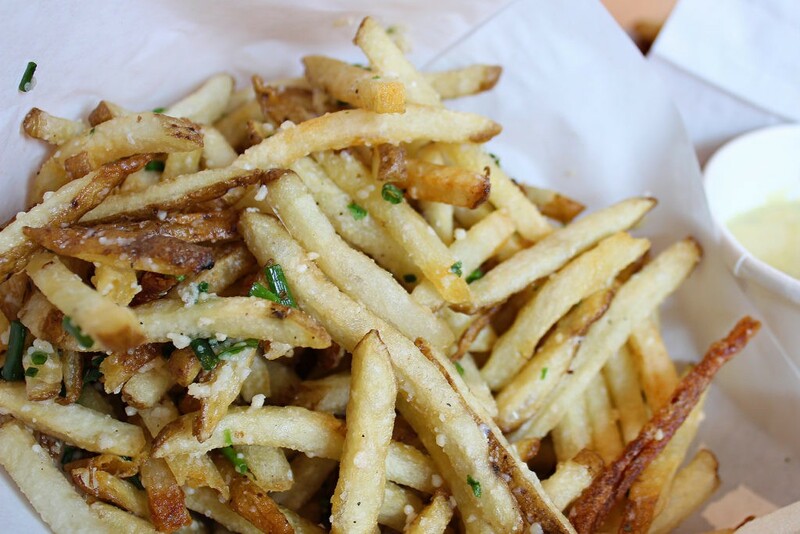 Truffle Fries with Parmesan are $6.95 and served with flavorful truffle aioli. You’ll also be pleased if you choose the green chile queso with your fry order ($6.75)—you may want to spread it on everything. Hopdoddy’s Kennebec Truffle Fries with Parmesan, $6.95. Photo by Scott Sandlin. Hopdoddy’s director of culinary operations, chef Hoss Bowen created the “Hoss’ Hot Chicken” ($9), a fried Nashville-style hot chicken breast on top of housemade baby kale slaw that first debuted at the new Rice Village location. This isn’t Buffalo-style sauced chicken. The crispy batter dipped in a spicy oil before serving. The cool slaw tempers the juicy, hot chicken just enough, but the tang of some on-board dill pickle slices would be a welcome addition. Hand-spun shakes are $5.50 to $6, and the Caramel Sea Salt and Nutella Chocolate Pretzel ones are especially popular. The Red Velvet shake gets its color from beet juice as opposed to food coloring. On tap are 18 Houston craft beers (12 regular, with 6 in rotation), as well as distilled spirits and wines produced in Texas. Happy hour runs Monday through Friday from 3 p.m. to 6:30 p.m. Craft drafts, wine, and signature sips, plus all fries and seasonal special burgers are just $5 each. Of the three burger joints visited, Hopdoddy has the most “grownup” atmosphere, but children are definitely welcome. The kid’s menu has a pint-sized burger, fries and drink for $6. There’s a community involvement aspect, too, as Hopdoddy donates $1 from the sales of every “Goodnight/Good Cause” burger to a local charity. The Rice Village location donates its proceeds to The Periwinkle Foundation, who provides programs for children and young adults cared for by the Texas Children’s Hospital for life-threatening illnesses, as well as for their families. The “Goodnight/Good Cause” Burger, Angus beef, Tillamook cheddar, caramelized onions, fresh jalapenos, hickory BBQ sauce, red leaf lettuce, onion, and tomato, is $8.25. Photo by Scott Sandlin. Bernie’s Burger Bus, 5407 Bellaire. Owner/chef Justin Turner launched his school bus-turned-food-truck burger concept, Bernie’s Burger Bus, in October 2010 after working for years as a personal chef for former Houston Rockets player Shane Battier and his family. Originally from Chicago, Turner grew to love Houston during the Battier’s time here, and decided to stay and focus on his burger enterprise after Battier left the Rockets in 2011. The first brick-and-mortar Bernie’s Burger Bus opened in 2014. A second in Katy soon followed. Turner attributes his success to the freshness of his product, burger meat blends and fresh cut fries produced in small batches, as well as how quickly orders can be filled. At Bernie’s, everything is made in a central commissary, even the ketchup and mayo. Turner believes they will ultimately be able to support the operation of five locations from this space. Unlike most burger joints, Bernie’s provides table service and the Bellaire location includes both indoor and covered outdoor dining options. The restaurant’s “school days” motif extends to burgers cleverly named for familiar school references. The base burger is “The Principal”, a six-ounce, Black Angus, flattop-seared patty with choice of cheese, housemade mayonnaise, mustard, ketchup, pickles, thin sliced onions, shredded lettuce and slow-roasted garlic tomatoes on a fresh Slow Dough Bread Co. bun ($9.65). Patty options include chicken for $1 more; or 100-percent grass-fed beef or bison for an additional $2. Any sandwich can be made into a veggie burger with a housemade falafel patty for no extra charge. If your eyes are bigger than your stomach, the “Detention” burger might catch your attention—two crispy bacon grilled cheese sandwiches are used to encase two cheddar cheeseburger patties, Bernie’s “tipsy onions”, and all the fixings from “The Principal”. This behemoth checks in at $18—the highest-priced burger at the places we visited. It’s an understatement to say that it’s big enough to share with a friend. Any burger can be kicked up with selections from the “Electives”, such as goat cheese, a fried egg, spicy guacamole, and more, for an additional $1.50 to $2 each. “The Cheerleader” from Bernie’s Burger Bus features pepper jack cheese, crispy battered jalapenos, slow-roasted garlic tomatoes, shredded lettuce, and jalapeno ranch, $10.40. Photo by Scott Sandlin. Bernie’s may have the most creative topping options of the burger joints we visited, and that creativity extends to the hand-cut russet potato fries. These come in two sizes—$3.90 for a small, and $4.90 for a large—and are served with Bernie’s signature housemade ketchup. Try the sweet potato fries, the Italian white truffle oil-laced fries with Parmesan and green onions and the bleu cheese varieties. Alternately, opt for those with toppings, like the “Lunch Lady Fries,” Bernie’s take on poutine with slow-cooked beef, local cheese curds, aged white cheddar, housemade brown gravy, and green onions. The small is $6.90 and the large is $8.65, which is more than enough to share with a whole table. For beverages, local craft beers are available (in both draft and cans/bottles), along with a few domestic options, plus wine and a full bar. Housemade lemonade are strawberry lemonade are both excellent, along with a variety of hand-spun shakes ($5 to $7 each). Bernie’s third brick-and-mortar location on Yale in The Heights is expected to be open by early summer 2017. Crispy Waffle Fries from Bernie’s current Field Trip Menu, tossed in house special seasoning and topped with green chile cheese sauce, pecan smoked bacon, red pepper crème, and green onions, $11 for a large as shown, $6 for a small. Photo by Scott Sandlin. Sure, the check at the end of a visit to these locations may be more than one might typically shell out for a quick burger and fry fix, but it’s not a meal that has to be reserved for a special occasion either. An all-natural, handcrafted burger experience is available in the Houston area at more locations than ever. The moderate expense for the level of quality and care put into every item they serve is a worthy investment. Jerry Built Homegrown Burgers, 3501 West Holcombe and 10403 Katy Freeway. Open Sunday through Thursday, 11 a.m. to 9 p.m., Friday and Saturday, 11 a.m. to 10 p.m.
Hopdoddy Burger Bar, 5510 Morningside Drive, Suite 100, open daily 11 a.m. to midnight and 4444 Westheimer, Suite H100, open Sunday through Thursday, 11 a.m. to 10 p.m. and Friday and Saturday, 11 a.m. to 11 p.m. Coming soon to 142 Vintage Park, Suite A.
Bernie’s Burger Bus, 5407 Bellaire Boulevard, and 2643 Commercial Center Boulevard, Katy. Open Sunday through Thursday, 11 a.m. to 9 p.m. Friday and Saturday, 11 a.m. to 9:30 p.m. Coming soon to 2200 Yale in The Heights.